left its outline etched in flight dust. emptiness where the beak should be. closing on that wraith-like prey. a tide still turns beneath the earth. Late sun, yellow as pumpkin flowers. the sun makes a square on the red lino. Outside hens peck at shreds of light. dizzy from touching the moon. It’s a time of winged things. Summer is taking flight and giving way to autumn. House martins are whirling through thundery air, stocking up on insects before their journey. In the park, Finley, aged two, is swinging higher and higher – ‘I’m flying …’ Jago, five, is standing still staring at the ground where there is a seething mass of silver wings among the grass. The muggy humid weather has created perfect conditions for flying ants to hatch. The newly emerged young queens and males are spiralling up on sweet-wrapper wings to mate in mid-air. Afterwards the queen bites off her wings, which have served their purpose, and creates a new nest by digging into the soil. The males, having mated, die. Finley blows the seeds of a dandelion – ‘two, three, six’ and hands me the bare stalk. We examine a stink bug (Coreus marginatus) which has landed on his jeans. A fly sits beside me on the picnic bench. The droning sound of bees blends with distant thunder. In the garden, borage and lavender are straggling everywhere, but I refuse to tidy up as the insects love these plants. Hoverflies, ladybirds, wasps and bees are pinned to every petal. As we watch the shimmering wings of the ants disappearing into the shadows of the lime trees we hear a loud roaring sound and the Red Arrows fly over in formation. Later is the sad news of the Hawker Hunter crash at Shoreham. Another full moon and another trip to the South Dorset Ridgeway – a mystical place even by day. This time I was in search of the elusive Nightjar or Fern Owl – a bird of myth and mystery. Dusk was falling as I climbed through narrow lanes towards Hardy’s monument at the top of the Ridgeway. Swathes of cow parsley glowed along the verges, seeming to have kept a little of the sun to light the way. The setting sun skimmed across the contours of the hills showing up tumuli, strip lynchets and other traces of prehistory. In ancient times, the slopes would have been forested so all dwellings and monuments were created on the barer summit. I stopped on the landward side of the Ridgeway before reaching Hardy’s monument and set off through darkening woodland with the sun disappearing between the branches. Black slugs were slithering out of the ferny borders onto the heathy path and I picked my way between them listening to the sound of birds settling down for the night. 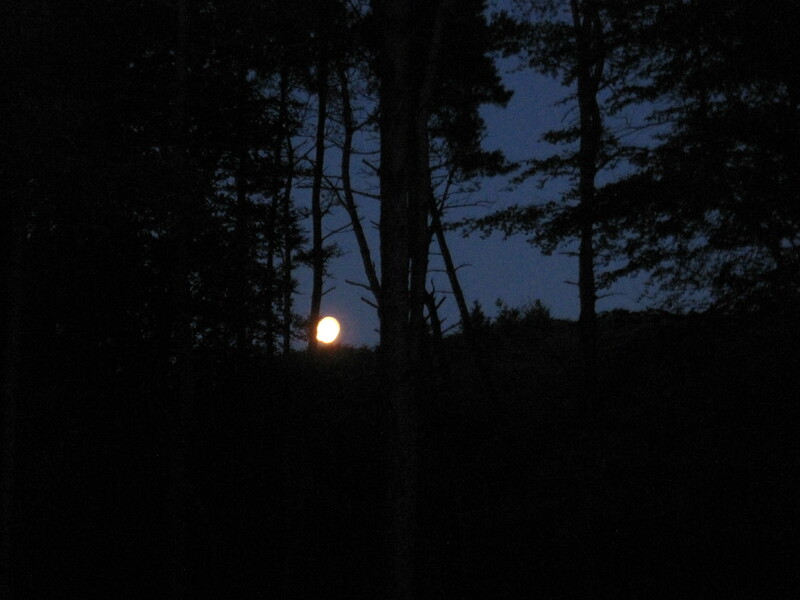 As the sun dipped to the western horizon a huge pink moon appeared in the east. I can easily imagine how primitive people would have seen this as a portent. It rose quickly above the Ridgeway and suddenly there were strange sounds among the trees. A whirring of insects, a rustling and fluster of moths. The air was full of the whispers of dusk – a language only heard in remote places after sunset. Then the sound I’d been waiting for – a soft rhythmic chirring and the silhouette of a bird overhead – swooping with staccato movements, bat-like – a nightjar, sometimes call the eve-jar. Then there were three dipping down low into the trees looking for moths. In the distance on a high branch was one of these mysterious birds keeping lookout. It was joined by another and they stayed there long enough for a photo in which its eye shone like a tiny moon. I waited for a while seeing glimpses of dark shapes flitting among the trees and listening to the distinctive whirring and chirring of their calls in the shadow of the Ridgeway. I drove home towing a huge golden moon behind me. A barn owl drifted low over the road and I heard myself say ‘wow’ – a totally inadequate word for such a special moment. As a child I spent my summer holidays in East Devon on the farm where my grandparents lived. I remember being fascinated by the red soil, the red cows and the red pebbles at Budleigh Salterton. This beach lies near the western end of the Jurassic Coast and at the mouth of the River Otter. Over fifty years ago I visited this place with my Grandma. Yesterday morning I stood here once more, studying the sculpted red cliffs behind the beach. At intervals, whitish bulges run vertically down from the cliff top. These are the fossilised roots of trees which had existed 235 million years ago when Britain was part of a huge land mass much nearer the equator. These trees had sent roots down into the red sandy desert searching for water. Minerals that dissolved in the water grew in crystals round the roots encasing them. As time went by the streams moved and the plants died leaving the nodules encasing their roots. The fossilised remains tell this ancient story. It was hard work walking on the beach over large round pebbles varying in colour from pale pink to dark red, some with vivid splotches and others veined with lines of quartz. There were small black ones with white stripes and pink marbled ones mottled with brown. These pebbles come from a layer in the cliff called the Budleigh Salterton Pebble Bed. They are unique and were deposited by a river 250 million years ago before being buried. Erosion has caused them to be dislodged from the cliff, forming the beach. They are made of a very hard rock called quartzite. On the shoreline were flanges of strange white jelly glistening among the pebbles. I think they must have been torn-off tentacles of the barrel jellyfish that have been sighted recently off the coast. There was little other debris apart from cuttle fish and the occasional crab shell. Behind the beach and the brightly coloured beach huts were banks of coastal wild flowers and the exotic Hottentot fig. The tufted tops of wild carrot, pink lacy thrift, pale convolvulus, woody tree mallows and valerian all flourished here with a buzzing throng of insects visiting the flower heads. In the distance the marshy mouth of the Otter formed a plateau backed by a row of trees that looked like a scene off an old railway poster, the reds and greens of this unique landscape giving the place a slightly surreal feeling. Somewhere inland, beavers were making this river their home. At the end of the day I was at Chiswell on Portland, towards the eastern end of the Jurassic Coast, watching the sun go down off Chesil. A beachcomber, limbs weathered like driftwood foraged on the shore grappling with a tangled mass of orange, blue and green rope. He eventually walked away leaving these dreadlocks from the sea sprawled on the pebbles like a punk-style mermaid.